Casual dining places like Ruby Tuesday’s, Houlihan’s, Applebee’s, TGIFriday, Chili’s, etc. all have a way of blending together in my mind. And they also all spell foods I can’t eat on a low-salt, low-fat, low-sugar diet (Ruby Tuesday’s salad bar is a wonderful exception). So my wife and I walked into a Houlihan’s in Naperville, a Far west Chicago suburb, for lunch with some trepidation recently. I thought perhaps I could order a stripped-down salad and use my own oil and vinegar as dressing. But not only was I surprised by the pleasant new decor, I also was able to get a meal to my low-salt specifications with only some modifying of a menu item. I ordered a five-ounce piece of salmon that normally is cooked basted in a butter sauce; I ordered it without the butter. And instead of mashed potatoes as a side, I asked for two vegetable portions (the meal normally comes with one veggie and the potatoes) and received asparagus and green beans. I asked both be made without butter or salt and that’s how they came out. The asparagus were grilled as was the salmon and both had a wonderful charcoally flavor to them as a result. A small cup of tartar sauce was served on the side, a bit odd for salmon which doesn’t need something like sauce to taste delicious. I think chefs can’t bear to send out a dish without at least one sauce. 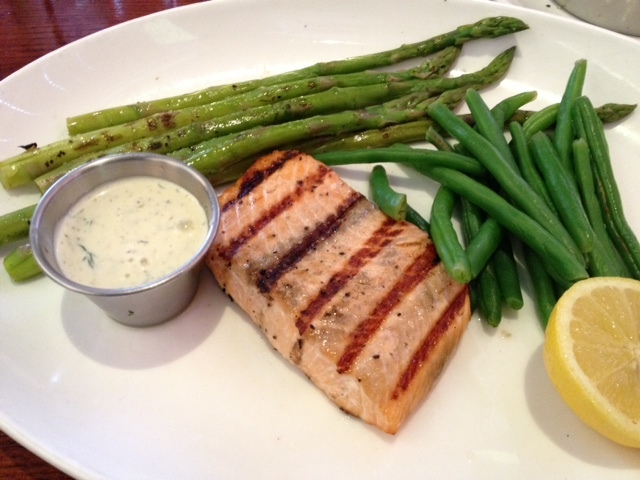 My wonderful lunch at Houlihan’s, salmon without butter or salt, asparagus and beans, also plain. And, for some unknown reason, tartar sauce which I didn’t eat. For an appetizer, my wife and I ordered edamame without salt. It’s listed as salted on the menu but getting it plain was no problem, which was nice. My wife modified a salad to get some relatively untouched chicken and a vinaigrette dressing. Interestingly, the waiter said they also offer just plain oil and vinegar, a simple choice that many places have abandoned for some reason I don’t understand. Al in all, it was a delightful lunch and a pleasant surprise. The price tag of $40 was higher than I expected, but we did have the appetizer plus we each ordered hot tea. One note, the chain apparently has a menu that it bills as lighter and lower in calories. I scanned that but every entrée had something I can’t eat included, either salty items such as soy sauce or miso or crusted items which likely also have a lot of salt. So I passed that up. Fewer calories doesn’t mean health when you’re searching for no-salt, no-fat and no-sugar, remember that.